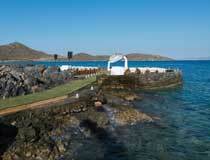 Ranking as the largest of the Greek islands, Crete boasts two airports. 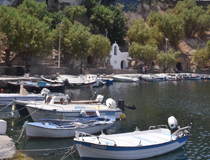 Splendid scenery, a diversity of landscapes, popular beaches and hidden coves, plus spectacular historical interest make Crete stand out as a major destination on the tourist map. 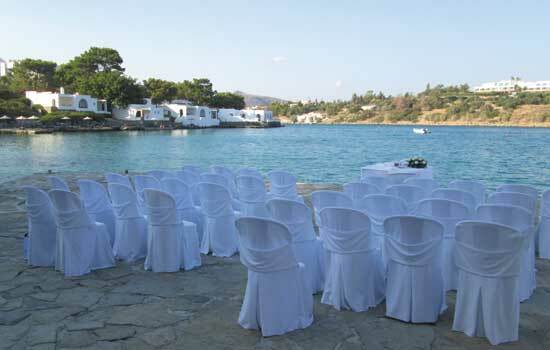 If you are thinking about getting married in Crete, the range of wedding venues includes a variety of luxurious hotels, registry offices in Heraklion and Rethymnon plus a very picturesque setting by the lake in Aghios Nikolaos. 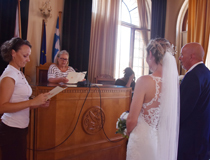 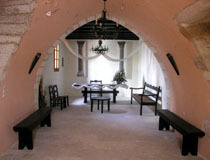 Registry Office weddings in Heraklion take place at the City Hall, housed in the Venetian Loggia, a historical building still adorned by its original 14th Century architectural features. 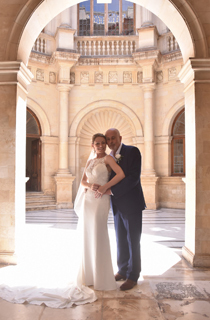 Considered to be one of the finest Venetian buildings in Crete, the Loggia stands in the heart of Heraklion and offers a grand setting for your civil ceremony. 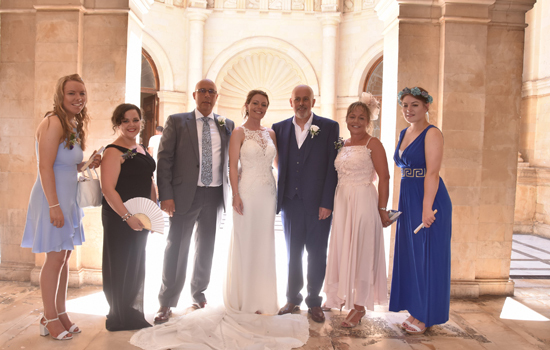 As shown here in all the stunning photographs very kindly supplied by Mr & Mrs Black who married at the Venetian Loggia in August 2018, there are lots of wonderful opportunities at the venue as well as in town for picturesque wedding photographs before heading to your reception that could be organised back at your hotel or at a local taverna, depending on your preference. 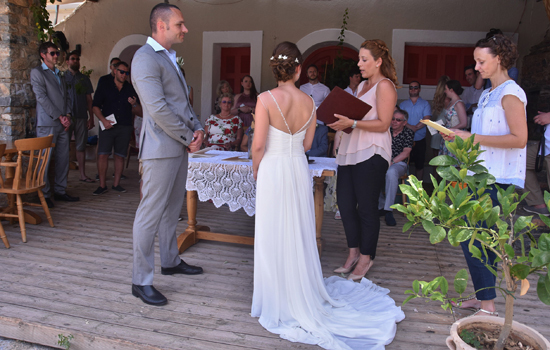 Located right by the waterfront in Gouves and giving access to a small beach, Isla by the Sea is a pretty restaurant and bar with a stunning paved terrace that perfectly lends itself to a picturesque and informal wedding ceremony setting with wonderful sea views. 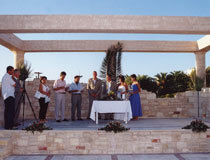 Once you have exchanged your vows you will not have far to go to share a few cocktails with relatives and friends before you enjoy a great wedding reception on-site. 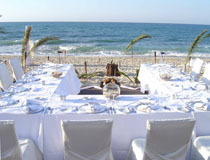 No matter whether you choose 'waiter service' or a buffet, we'll discuss with you the menus that can be arranged on your behalf. 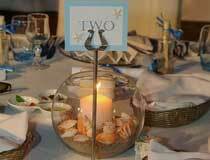 Whilst this venue is not exclusive to wedding parties, a special area will be set out for you and your guests to enjoy a very convivial time on your important day. 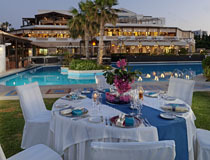 Member of the Great Hotels of the World and located by a sandy beach some 2km from Hersonissos, the Aldemar Knossos Royal is a 5-Star resort that truly boasts 5-Star amenities and service. 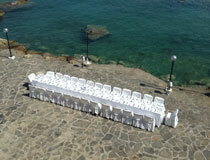 Various choices are available for your wedding ceremony including the 'platform by the sea' a stunning wedding venue that is located just on the edge of the Aldemar Knossos Royal Hotel. 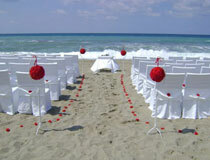 For a true sand-between-your-toes ceremony, there is now a wonderful beach setting right by the waterfront! 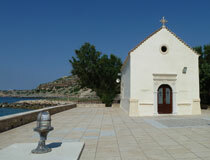 Another very attractive location is by the side of the cute chapel. 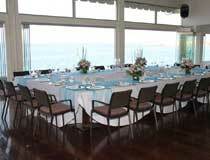 This amazing setting boasts glorious sea views and catering for your reception can also be organised in this picturesque spot. 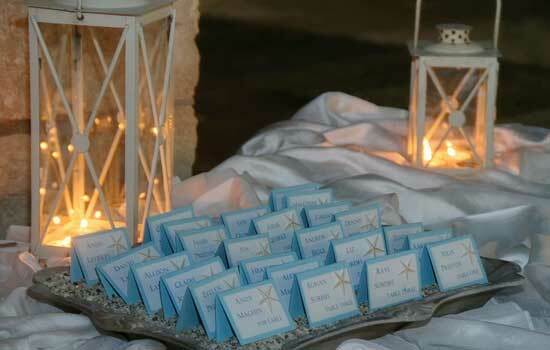 Decorations can be added to your wishes and a popular option is to fill the rocks with romantic candles! 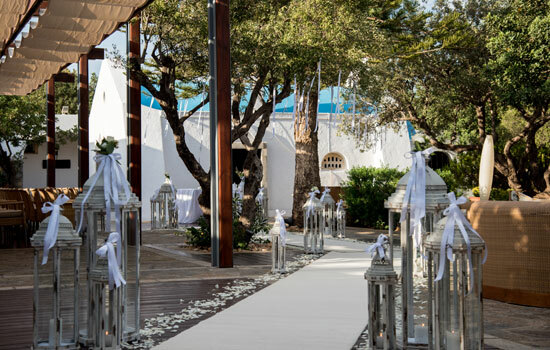 We will also be able to suggest stylish options for your wedding reception, whether you wish it to be very close to the waterfront, by the poolside or in the Fontana Amorosa restaurant that offers inside sitting as well as on its terrace. 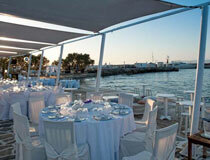 Aldemar Knossos Royal Hotel offers a wonderful range of accommodation, including Suites with private pool. 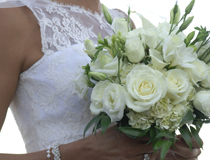 And for pampering treats before and/or after your wedding day, ask us for details of the on-site Thalasso Spa Centre, a perfect way to calm those pre-wedding nerves or the chance to enjoy relaxing moments with your new spouse after your big day. 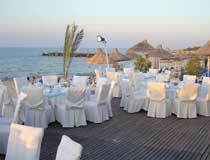 Member of the Great Hotels of the World and located by a sandy beach some 2km from Hersonissos, the Aldemar Royal Mare is a 5-Star resort that combines a host of top-class amenities and high level of service. 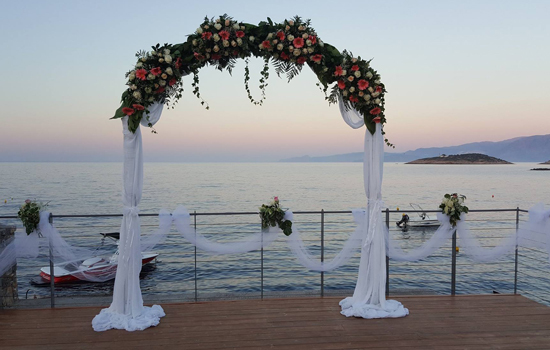 The 'beach deck' is a wonderful venue for your ceremony and anything can be added to embellish this already perfect setting, be it flowers on the arch, candles or anything you may wish to add a special flavour to your important moment. 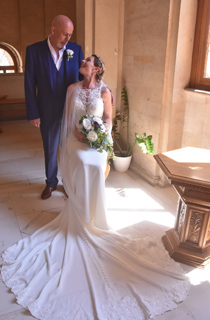 Following your ceremony, drinks and canapes can be organised to toast your newly-wed status then why not head to the on-site Albatros restaurant to carry on your celebrations with a sumptuous buffet or lavish reception for family and guests? 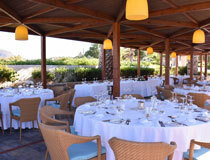 Aldemar Royal Mare Hotel offers a wonderful range of accommodation, including Suites with private pool. 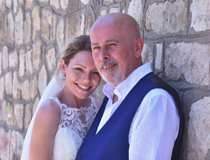 And for pampering treats before and/or after your wedding day, ask us for details of the on-site Thalasso Spa Centre, a perfect way to calm those pre-wedding nerves or the chance to enjoy relaxing moments with your new spouse after your big day. 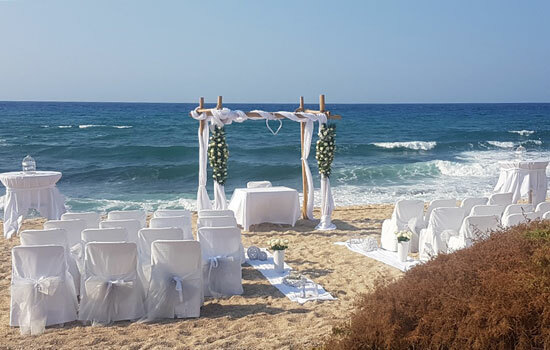 Close to Hersonissos and sitting by a long sweeping sandy bay, Creta Maris Beach Resort is a 5-Star option for your wedding day and honeymoon. 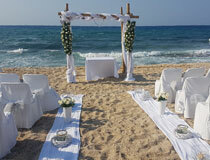 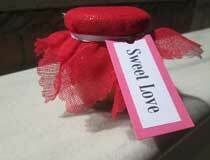 As you would expect at a holiday resort that is made up of two hotels, the choice of wedding venues is plentiful. 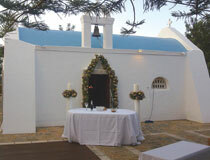 A favourite ceremony location is outside the pretty chapel, located on the upper part of the resort where guests can be seated around the ceremony area or more formally in a 2-columns chair set-up. 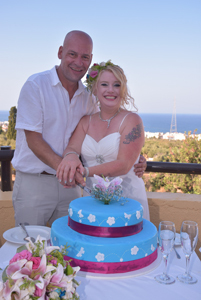 Another equally lovely venue is on the outdoor terrace of Cochlias restaurant, an ideal location for a private wedding with the added bonus of uninterrupted sea views! 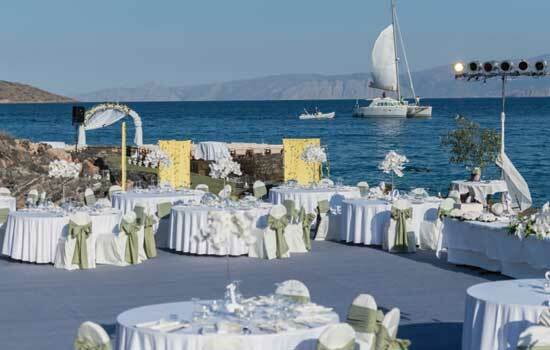 Or you may wish to choose to meet up with your future spouse on the steps of the Plakoura area and walk together to join your wedding guests on the panoramic paved terrace right by the sea. 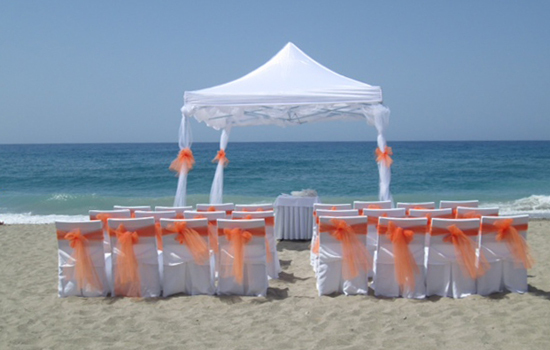 And once you have finally chosen where to hold your ceremony, you’ll need to also decide where your wedding reception is to take place. 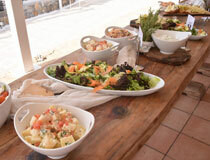 Yes, you’ve guessed it, lots of options too: the BBQ cuisine at Cochlias Restaurant (sea view included! 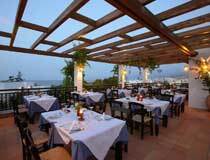 )… the beautiful terrace of Pithos Restaurant with its organic Cretan cuisine menu… or the Almyra Restaurant located next to the main pool and the sea! 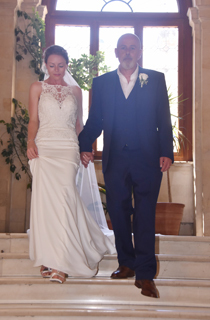 We’ll take you through all the choices to ensure everything is tailor-made to your wishes and will add all the little extras you may need to make it as perfect as can be! 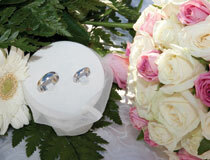 This delightful setting embraces wonderful mythical legends. 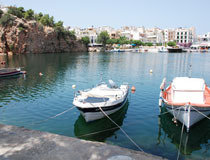 Claimed to be ‘bottomless’, the seawater lake in Aghios Nikolaos is said to have been favoured as a bathing spot by the Goddess Athina and it is also alleged that an under-water tunnel links it all the way to the island of Santorini. 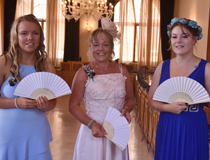 The fact of the matter is that it is a very enchanting wedding venue when you are looking for something different to the norm. 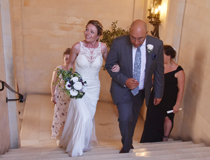 To keep the suspense a little longer and ensure your husband-to-be and your guests do not see you (the bride) until the very last minute, we'll arrange for you to reach the actual ceremony location by the water's edge via a stairway located above the venue. 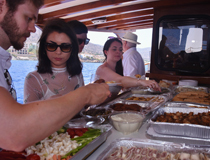 As this part of Aghios Nikolaos is always popular, your party will undoubtedly attract many on-lookers as you all gather on the picturesque waterfront to take your important vows..
a very special Celebratory Cruise. 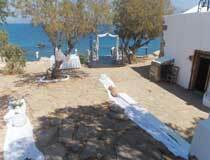 the Marilena Taverna in Elounda (scroll down for details of this gorgeous venue). 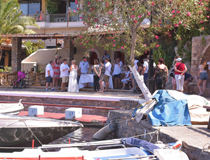 by the picturesque island of Spinalonga, the site of a leper colony from 1903 to 1957.
the 16th century fortifications would be an amazing backdrop to your photos. 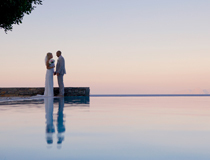 Here is a wonderful opportunity to enjoy the very best day of your life at the luxurious St Nicolas Bay Resort Hotel, located some 2km from Aghios Nikolaos. 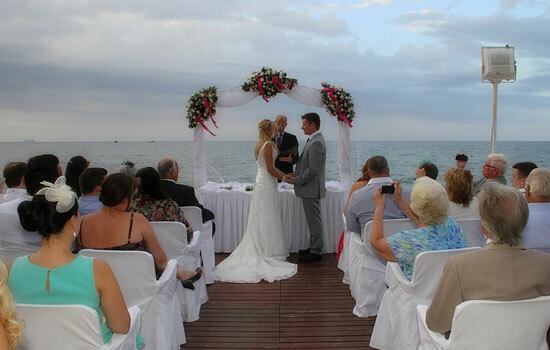 Suggestions for the venue of your civil ceremony include various locations on-site, and even the chance to have the wedding table and chairs for your guests set by the hotel’s private sandy beach - a romantic spot late afternoon when the service takes place. 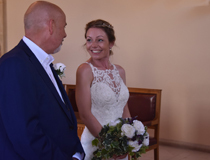 The wedding couple and some of the guests (depending on party size) must book to stay at the hotel and your reception must also be held at St Nicolas Bay and we will supply you with menus of what can be arranged on your behalf. 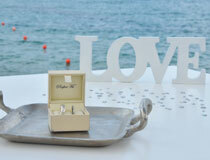 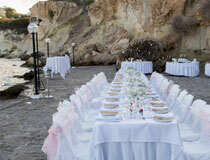 Minos Beach Art Hotel is a 5-Star choice for anyone thinking about getting married in Crete. 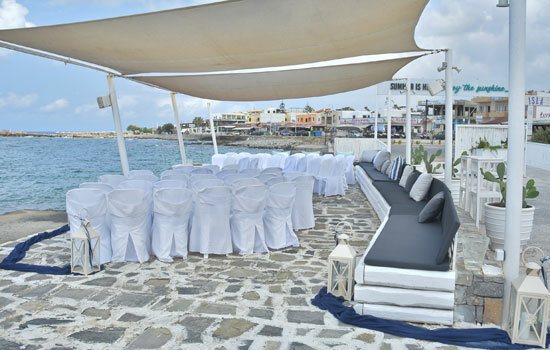 It offers couples the chance to enjoy a civil ceremony at a variety of locations within the hotel’s grounds, such as the paved terrace by the waterfront (shown here), conveniently close to the Pure Lounge Bar and an ideal setting for a cocktail party. 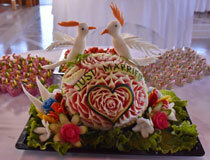 Of course, we’ll give you full details of culinary delights on offer to ‘wow’ your guests at your reception. 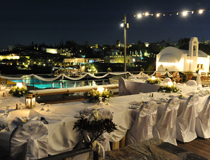 These prestigious hotels offer two main buildings and numerous bungalow-style units dotted amidst vast grounds by the Bay of Mirabello. 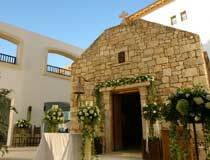 Amongst the various venues available for wedding ceremonies at the Elounda Beach Hotel or Elounda Bay Palace, the setting outside the on-site chapel is always a popular choice. 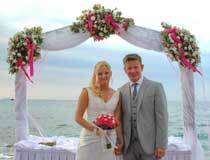 The Wedding Package detailed below includes many highlights and extra finishing touches can be added as you wish. 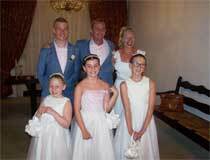 Both hotels stipulate that the wedding couple and some of the guests (depending on party size) must book to stay at the hotel. 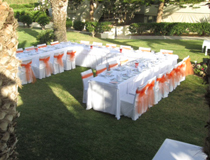 Additionally, as your reception must take place on-site, menus for cocktail parties, buffets or more formal dinners can be obtained on your behalf. 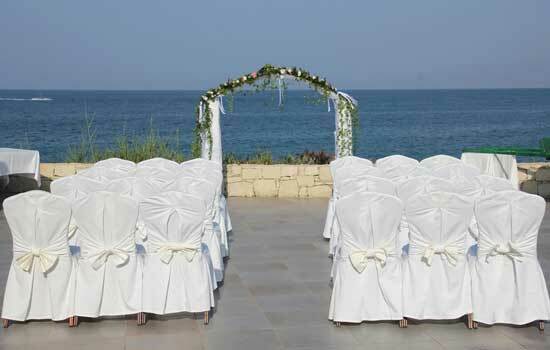 An excellent wedding package (exclusive to Planet Holidays) has been put together at the 5-Star Rethymno Mare Royal, with the civil wedding ceremony set to take place early evening on the panoramic sea view balcony or at the very pretty amphitheatre area. 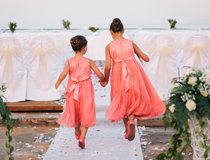 To enhance your day, various inclusions will be provided with the compliments of the hotel when you book to stay at the Rethymno Mare Royal for a minimum of 7 nights - a perfect chance to meet everyone involved in the preparations. 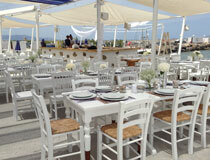 We also suggest that you enquire about the 4-Star Rethymno Mare, next door, where your guests could stay. 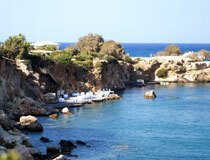 With its attractive harbour, Venetian fortress, traditional houses, mosques plus a scenic coastline, Rethymnon offers plenty for romantic couples. 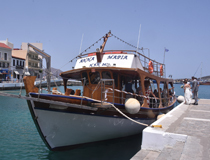 To reach Rethymnon's Old Town Hall, St Lazarus Chapel, we will guide you from the harbour on a short walk through the narrow streets of the old town. 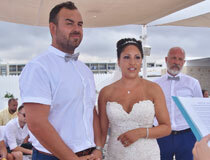 After the ceremony, there will be lots of opportunities for photographs. 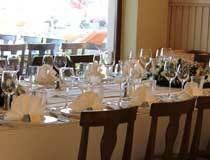 There are excellent venues for your reception in town, including the superb restaurant at the Avli Lounge Apartments. 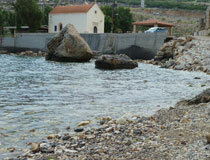 Located about 6km west of Rethymnon, the area of Gerani Bridge sits below the highway that gives easy access to a small pebbly cove. 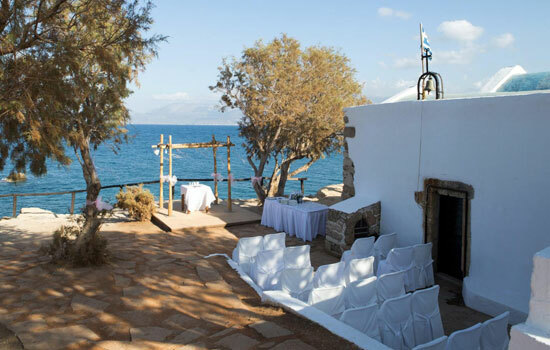 The panoramic terrace that surrounds the cute little chapel just above the bay is one of our latest wedding venues in Crete. 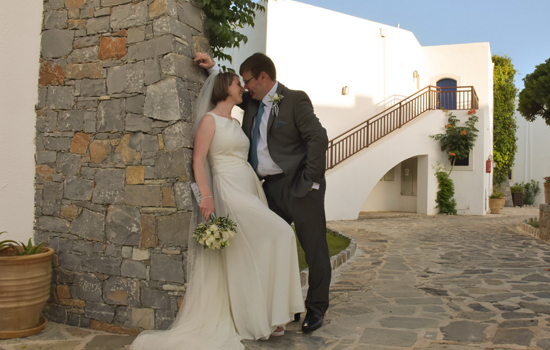 With the civil ceremony taking place on the terrace, the chance to have photographs by the waterfront followed by an informal reception at the local taverna next to the chapel (or indeed anywhere else you prefer), this picturesque addition to our programme will suit anyone looking for scenic and relaxed surroundings. 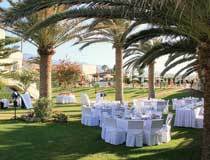 Bordering the sandy beach in Platanias (a short drive from the centre of Rethymnon), the Minos Mare Resort & Spa is made up of 2 hotels. 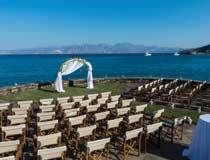 Here, couples have a lovely choice of settings to celebrate the most important day of their lives. 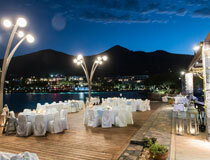 The beach venue is one of the favourite options, followed by a cocktail party/reception in the hotel’s beachside gardens. 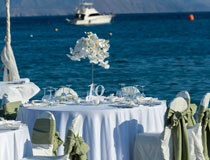 we can also recommend and organise your reception at a selection of excellent restaurants/tavernas in Crete. 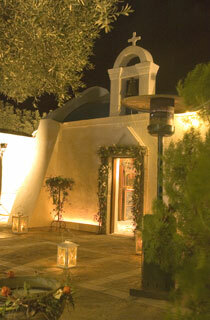 Located in the village of Elounda, Marilena is a traditional and family-owned Greek restaurant. 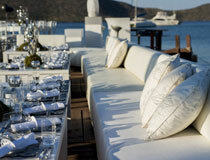 Its long-standing reputation as one of Elounda’s finest restaurants is complemented by a welcoming atmosphere where guests are invited to experience great food in great surroundings. 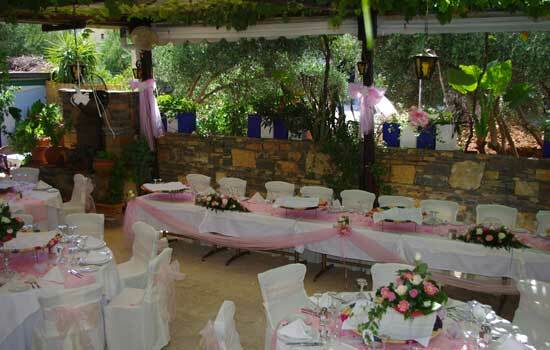 With a front terrace, indoor seating plus a spacious, private and charming vine-covered garden at the back of the property, Marilena Restaurant is large and versatile to cater for your party. 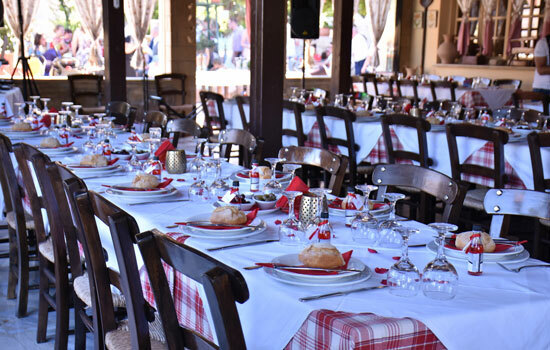 No matter whether you fancy a barbecue or would prefer one of the various set menus available, your reception at Marilena will delight you and your guests. 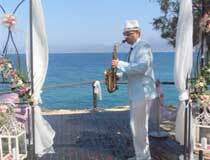 And to add even more local flavour, Greek music and dancing can also be organised! 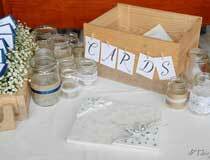 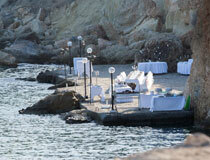 for your wedding reception is Mylos Taverna in Gouves. 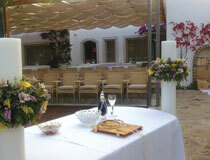 Friendly and informal, this is a charming setting to enjoy good food in good company. 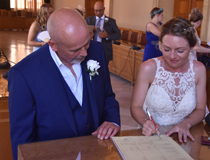 We'll give you full details of what can be organised on your behalf and add all the Finishing Touches you may require to tailor-make your wedding reception to suit your requirements. 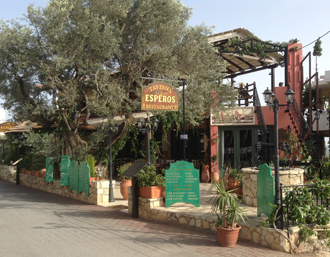 Located less than 1km from Hersonissos, the village of Koutouloufari, with its paved streets and old stone houses, brims with picturesque local Cretan charm. 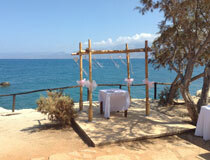 Part of this lovely setting is the Esperos Taverna, one of our latest recommendations for your wedding reception venue. 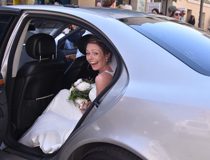 Family-run, a warm welcome is always guaranteed, not least on your wedding day! 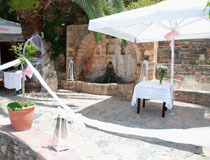 Combine the friendly atmosphere with a roof garden boasting gorgeous sea views in the distance and a choice of menus for your Cretan feast, it's fair to say that Esperos Taverna is an absolute treat for all senses and a perfect location to celebrate your very special day with relatives and friends. 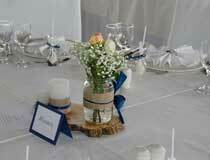 including table decorations to match or complement your wedding colour scheme. 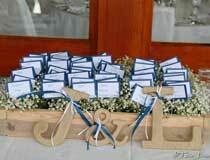 what you have in mind. 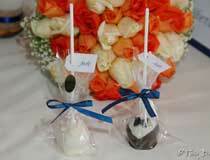 (All prices on request).